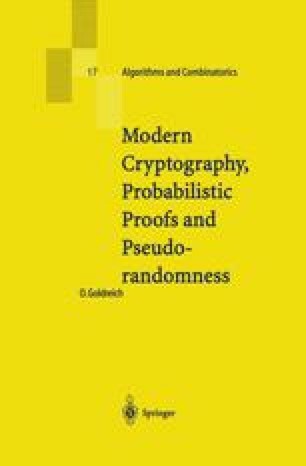 In our opinion, the Foundations of Cryptography are the paradigms, approaches and techniques used to conceptualize, define and provide solutions to natural cryptographic problems. In this chapter, we survey some of these paradigms, approaches and techniques as well as some of the fundamental results obtained using them. Special effort is made in attempt to dissolve common misconceptions regarding these paradigms and results. It is possible to build a cabin with no foundations, but not a lasting building. O. Goldreich. Lecture Notes on Encryption, Signatures and Cryptographic Protocol. Spring 1989. Available from http://theory.lcs.mit.edu/r-oded/ln89.html. O. Goldreich. Secure Multi-Party Computation. In preparation, 1998. Working draft available from http://theory.lcs.mit.edu/eroded/gmw.html.